This article is about the event. 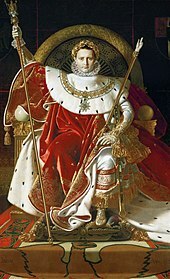 For the painting, see The Coronation of Napoleon. The coronation of Napoleon as Emperor of the French took place on Sunday December 2, 1804 (11 Frimaire, Year XIII according to the French Republican Calendar) at Notre Dame Cathedral in Paris. It marked "the instantiation of modern empire" and was a "transparently masterminded piece of modern propaganda". Napoleon wanted to establish the legitimacy of his imperial reign, with its new royal family and new nobility. To this end, he designed a new coronation ceremony unlike that for the kings of France, which had emphasized the king's consecration (sacre) and anointment and was conferred by the archbishop of Reims in Reims Cathedral. Napoleon's was a sacred ceremony held in the great cathedral of Notre Dame de Paris in the presence of Pope Pius VII. Napoleon brought together various rites and customs, incorporating ceremonies of Carolingian tradition, the ancien régime and the French Revolution, all presented in sumptuous luxury. When Pope Pius VII agreed to come to Paris to officiate at Napoleon's coronation, it was initially established that it would follow the coronation liturgy in the Roman Pontifical. However, after the Pope's arrival, Napoleon persuaded the Papal delegation to allow the introduction of several French elements in the rite - such as the singing of the Veni Creator for the monarch's entrance procession, the use of Chrism instead of the Oil of Catechumens for the anointing (although the Roman anointing prayers were used), placing the sacred oil on the head and hands rather than the right arm and back of the neck, and the inclusion of several prayers and formulas from the French Coronation of Kings ceremonial, to bless the regalia as it was delivered. In essence, French and Roman elements were combined into a new rite unique to the occasion. Also, the special rite composed ad hoc allowed Napoleon to remain mostly seated and not kneeling during the delivery of the regalia and during several other ceremonies, and reduced his acceptance of the oath demanded by the Church in the beginning of the liturgy to one word only. Not wanting to be an Old Regime monarch, Napoleon explained: "To be a king is to inherit old ideas and genealogy. I don't want to descend from anyone." Commemorative coin with the image of Pius VII on the obverse and Notre Dame de Paris on the reverse. Note that the date on the reverse is given both according to the Gregorian and French Revolutionary calendars. The ceremony started at 9 a.m. when the Papal procession set out from the Tuileries led by a bishop on a mule holding aloft the Papal crucifix. The Pope entered Notre Dame first, to the anthem Tu es Petrus, and took his seat on a throne near the high altar. Napoleon's and Joséphine's carriage was drawn by eight bay horses and escorted by grenadiers à cheval and gendarmes d'élite. The two parts of the ceremony were held at different ends of Notre Dame to contrast its religious and secular facets. An unmanned balloon, ablaze with three thousand lights in an imperial crown pattern, was launched from the front of Notre Dame during the celebration. Before entering Notre Dame, Napoleon was vested in a long white satin tunic embroidered in gold thread and Josephine similarly wore a white satin empire-style dress embroidered in gold thread. During the coronation he was formally clothed in a heavy coronation mantle of crimson velvet lined with ermine; the velvet was covered with embroidered golden bees, drawn from the golden bees among the regalia that had been discovered in the Merovingian tomb of Childeric I, a symbol that looked beyond the Bourbon past and linked the new dynasty with the ancient Merovingians; the bee replaced the fleur-de-lis on imperial tapestries and garments. The mantle weighed at least eighty pounds and was supported by four dignitaries. :299 Josephine was at the same time formally clothed in a similar crimson velvet mantle embroidered with bees in gold thread and lined with ermine, which was borne by Napoleon's three sisters. [nb 1] There were two orchestras with four choruses, numerous military bands playing heroic marches, and over three hundred musicians. :302 A 400-voice choir performed Paisiello's "Mass" and "Te Deum". Because the traditional royal crown had been destroyed during the French Revolution, the so-called Crown of Napoleon, made to look medieval and called the "crown of Charlemagne" for the occasion,:55 was waiting on the altar. While the crown was new, the sceptre was reputed to have belonged to Charles V and the sword to Philip III. 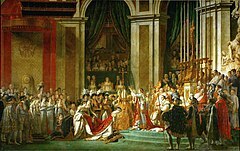 The coronation of Napoleon and Josephine also differed in this respect from the pattern observed in other Western coronation rites: usually, in joint coronations of sovereign and consort, the sovereign is first anointed, invested with the regalia, crowned and enthroned, and only then is a similar but simplified rite of anointing, investiture, coronation and enthronement of the consort performed. However, for the Coronation of Napoleon and Josephine, each of those steps was performed jointly, so that Josephine was anointed immediately after Napoleon, and each item of regalia was delivered to her immediately after being given to him, a procedure that found no precedent either in the Roman Pontifical or in the French Ceremonial. 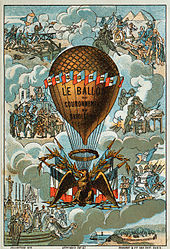 The text was presented to Napoleon by the President of the Senate, the President of Legislature and the most senior President of the Council of State. After the oath the newly appointed herald of arms proclaimed loudly: "The thrice glorious and thrice august Emperor Napoleon is crowned and enthroned. Long live the Emperor!" During the people's acclamations Napoleon, surrounded by dignitaries, left the cathedral while the choir sang "Domine salvum fac imperatorem nostrum Napoleonem"—"God save our Emperor Napoleon". After the coronation the Emperor presented the imperial standards to each of his regiments. According to government tallies, the entire cost was over 8.5 million francs. In addition to David's paintings, a commemorative medal was struck with the reverse design by Antoine-Denis Chaudet. In 2005, a digital depiction of the coronation was made by Vaughan Hart, Peter Hicks and Joe Robson for the "Nelson and Napoleon" Exhibition at the National Maritime Museum. ^ There is an anecdotal account that just as Josephine reached the top of the steps of the high altar to be crowned, Napoleon's sisters deliberately gave her mantle a sudden tug which momentarily caused her to lose her balance, but she did not fall as her sisters-in-law had intended. ^ With the substitution of the word "emperor" for "king" and the addition of the words "and of his consort" to the original prayer from the Roman Rite; a similar, but more elaborate prayer, specifically mentioning the " kingdoms of the Franks, the Burgundians, and of Aquitania" existed in the traditional French royal coronation rite. ^ The blessings for the sword, rings, gloves, the Hand of Justice and the scepter were taken from the Cérémoniel françois, while the blessing of the orb was special composed for the occasion. ^ The forms for the delivery of the sword, rings, gloves, Hand of Justice and the scepter were also from the Cérémoniel françois, while that for the delivery of the mantles and the Orb were also specially composed for the occasion. 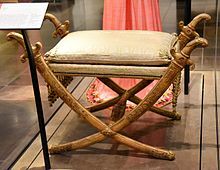 ^ The forms for the delivery of the rings and the mantles were in the plural, since they were given to the Emperor and Empress simultaneously. ^ This enthronement formula was a new composition, different from all the variations of the traditional "Sta et retine..." formula usually employed in Western Coronation rites; even the starting words of the formula were different, and in all probability the traditional prayer was abandoned because it specified too clearly that the monarch received the Throne from the bishops and was a mediator between clergy and people. The new formula used for Napoleon's enthronement avoided any mention of this. ^ Porterfield, Todd Burke; Siegfried, Susan L. (2006). Staging empire: Napoleon, Ingres, and David. Penn State Press. p. 4. ISBN 978-0-271-02858-3. Retrieved 1 December 2011. ^ a b c Englund, Steven (2005-04-30). Napoleon: A Political Life. Harvard University Press. ISBN 978-0-674-01803-7. Retrieved 1 December 2011. ^ a b c d e f g h Woolley, Reginald Maxwell (1915). Coronation Rites. Cambridge University Press. pp. 106–107. ^ a b c Junot, Laure, duchesse d'Abrantès (1836). Memoirs of Napoleon, his court and family. 2. R. Bentley. Retrieved 1 December 2011. ^ a b c Wairy, Louis Constant (1895). Recollections of the private life of Napoleon. 1. The Merriam company. Retrieved 1 December 2011. ^ Procèsverbal de la cérémonie du sacre et du couronnement de LL. MM. l'Empereur Napoléon et l'impératrice Joséphine. de l'imprimerie impériale. 1805. ^ "J. David Markham Napoleonic History - Welcome to Napoleonic History!". ^ Sloane, William Milligan (1910). The Life of Napoleon Bonaparte. The Century Co. p. 344. Retrieved 30 November 2017. ^ Peter Hicks (10 December 2009). "Coronation and consecration of Napoleon I" – via YouTube. Wikimedia Commons has media related to Coronation of Napoleon I.